Please call it will be our pleasure to show it to you! The museum is open all year round by appointment only (call 503-436-4012 or cell 301-208-8060). If you see the banners are up, then we're open to the public for special occasions! Check out our NEW!!! Online video tour of the museum, with the origin story narrated by Melodie Chenevert! 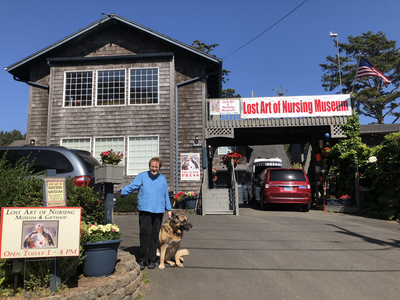 Welcome to the Lost Art of Nursing Museum! There was a time when nursing was celebrated in song and verse. When world famous artists were commissioned to capture nurses on canvas. When magazine covers, advertisements, poems, and sheet music immortalized nurses. When books, dolls, and toys made every little girl dream of being a nurse when she grew up. There was a time when it was bold, noble, and patriotic to be a nurse. That time has come again! A Poem by Clara Barton, who served as a nurse in the Civil War, founded the American Red Cross in 1881 and shamed Congress into signing on to the Geneva Convention. Illustrated with images of WWI Nurses. - A Poem by Clara Barton, who served as a nurse in the Civil War, founded the American Red Cross in 1881 and shamed Congress into signing on to the Geneva Convention. Illustrated with images of WWI Nurses. Click to read our newest Book!! If you found this page because you were looking up the Poem Being a Nurse Means then you have found the author! Melodie Chenevert personally wrote the poem and it is copyrighted. You absolutely MUST ask permission before trying to use it. Thank you!